You want to park downhill on a two-way road and there is no curb. Which way do you turn your front wheels? When parking facing downhill on a road with or without a curb, or when facing uphill on a road without a curb, turn your front wheels toward the edge of the road so your vehicle will roll away from traffic if the brakes fail. However, when parking uphill on a road with a curb, turn your wheels toward the center of the road so the vehicle will roll into the curb if the brakes fail. Which of the following substances can affect the ability to drive? Cough syrups and cold tablets containing codeine or antihistamines. A number of drugs can impair your ability to drive, including depressant medications like tranquilizers and sedatives; over-the-counter cough syrups, cold tablets, and allergy medications (which may contain impairing substances like alcohol, codeine, or antihistamines); and illegal drugs. Should yield the right-of-way to cross traffic. Should force their way into traffic. When approaching a T intersection while traveling on the street ending at the intersection, you must stop and yield the right-of-way to cross traffic. Only proceed when it is safe to do so. 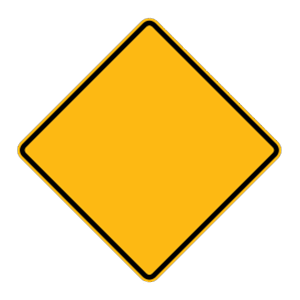 A diamond-shaped yellow sign warns of possible danger ahead. Orange signs, which are mostly diamond-shaped, are used to warn of possible dangers in or near work areas. Using safe driving strategies to prevent crashes. More dangerous than not driving defensively. Defensive driving is using safe driving strategies to prevent crashes. This means that you alter your driving to fit the weather conditions, the way you feel, and the actions of other drivers, bicyclists, and pedestrians.